RedLynx seem to understand the importance of a good soundtrack. The intro stings for Trials Evolution: Gold Edition were a perfect example. Dumb, brash and ridiculous, they nevertheless prepared players for the silliness involved in mastering the game's challenging 2D obstacle courses. 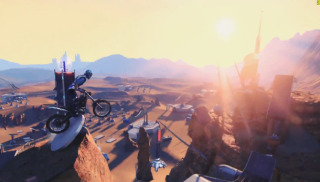 The rousing rock of this trailer for the upcoming Trials Fusion also captures this spirit. I've watched the teaser multiple times now, and I am more than ready to wheelie, flip and crash my way through more motorcycle madness. Unfortunately, I've still got a few months to wait. As revealed by the trailer, Trials Fusion will be released for all formats on April 16th. It's nice to see the series return to a multi-format release. The previous Trials HD and Trials Evolution both started out as XBLA exclusives, not reaching PC until last year's Gold Edition. Of course, this is still a Ubisoft published game, so there's every chance the PC version will still be delayed for no sensible reason. As the trailer shows, this new Trials seems to put a heavier emphasis on tricks and stunts. I'll be interested to see how that gels with the game's tricky-to-master physics system. Previously, even attempting a flip would be enough to send me face first into a rock, so a full 360 Suicide Can is going to be quite an ask.